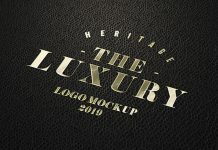 A beautiful glossy letterpress logo mockup on textured kraft paper a must have for logo designers. Place your monogram, logotype, logomark or typography inside smart object and get a super realistic outcome. There are some effects and lighting applied in psd file, you can customize them as per your requirement or use the existing effects if you are satisfied with the result.